Receiving daily flights from Athens, Kefalonia Island International Airport (EFL) is the only airport serving this popular Greek holiday destination. Kefalonia is the biggest of Greece's Ionian Islands and its airport lies on the southern side of Argostoli town, the island's capital, close to the nearby resorts and villages of Keramies, Metaxata, Pessada, Sarlata, Spartia and Svoronata. Kefalonia Airport services about 400,000 passengers annually. Travellers from across the world can easy reach Kefalonia via Athens on Olympic Airlines, which boasts a flight time of only 45 minutes. The airport has one terminal to serve both arrivals and departures, being at its busiest during the summer months, when many charter flights arrive. The neighbouring islands of both Lefkas and Zakynthos can be reached by boat, using the frequent Ionian Island Hopper service. The airport is located between Lassi and Minies, just 8 km / 5 miles to the south of Argostoli, the island's capital. To get to Argostoli, Lixouri or any other town, city or resort on the island, travellers can take a taxi, private mini-van or hire a car. Close to Argostoli and linked by airport buses or taxis, Lassi has become a particularly popular resort on Kefalonia, due in no small part to its appearance in the blockbuster movie 'Captain Corelli's Mandolin'. 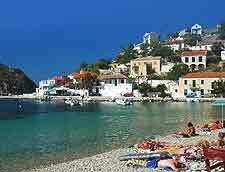 The island of Kefalonia is the largest of the Greek Ionian Islands. It's filled with natural wonders, great archaeological treasures and beautiful beaches, such as Kounopetra Beach, Mania Beach and Myrtos Beach. Kefalonia is supposed to be the least developed of the Greek islands, but it still has a full-service tourist industry with a large range of resorts and restaurants on offer. Much of the island's accommodation can be found close to Kefalonia Airport (EFL), in nearby Argostoli, the island's capital. Argostoli tour operators offer daily excursions to the island's beaches and mountains. Visitors will find plenty of restaurants and shops at Central Square and along the waterfront.